. 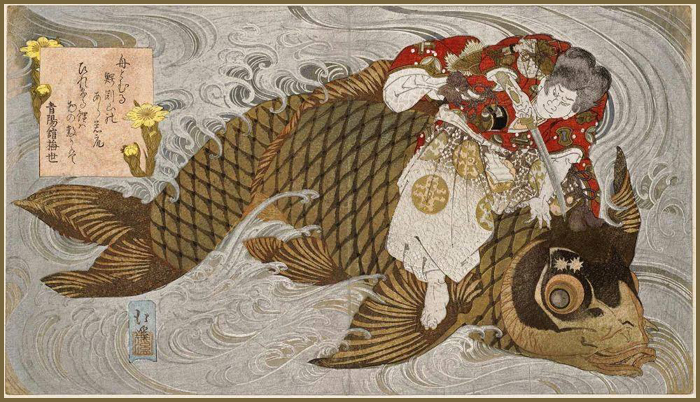 The Carp in Japanese Culture - Introduction .
. Koi 鯉 carp and fish as folk toys . 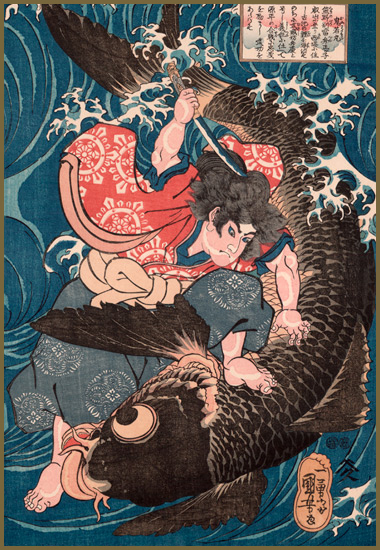 Musashibo Benkei was called Oniwakamaru - "demon child, ogre child" in his youth. His mother was pregnant for 18 months with him and when the baby was born, it has already hair and teeth. He was so strong he could fight against 200 men and win. Since he was such a problem, he was given to Western Part of the mountain monestary at Hieizan 比叡山西塔. At that time he was called 西塔鬼若丸 "Saito Oniwakamaru".
. Musashibo Benkei 武蔵坊弁慶 . Koi are a legendary fish. Graceful, vibrant, and one of the most recognizable fish in the world, koi are well-loved and respected. Often associated with Japan, koi actually originated from Central Asia in China. They were introduced to Japan by Chinese invaders. Koi fish are also symbolized according to their coloration.. . .
. Hidari Jingoroo 左甚五郎 Hidari Jingoro - master carver . A villager caught a huge carp, but the animal had legs and fas in fact a salamander. It is called "hazekoi". After he caught this animal, suddenly the water supply of the village became less and less. It was the curse of the Salamander. Now people never catch any salamander and pray at the local shrine for its well-being. And the greatful salamander now shape-shifts into real carp every year to grant them a good fishing harvest.
. sanshoouo, sanshoo uo 山椒魚 salamander . In the year 1028 a person named 角田将監 Kakuda Shogen was hit by a huge typhoon. The big 大榎 huckberry tree in his garden had fallen down, so be begun to dig a well in this place. After a short while, clear water welled up from the ground and a huge higoi 緋鯉 golden red carp showed up. This was an auspicious sign. When the village headman 持田 Mochida went to Tokyo to report the event.